WEST PALM BEACH, Florida (CNN) - President Donald Trump remained focused on the Russia matter on Monday, questioning in a tweet why his predecessor didn't act to prevent Moscow from interfering in US elections. "Obama was President up to, and beyond, the 2016 Election. So why didn't he do something about Russian meddling?" Trump wrote just after 3 p.m. ET after returning from a round of golf at his course. It's a line of criticism Trump has used previously when attempting to deflect attention from accusations his campaign associates colluded with Russia in the run-up to the 2016 contest. Trump has adamantly denied any cooperation between his team and Russia and has called the investigation a Democratic hoax. That defense was undercut last week when FBI special counsel Robert Mueller handed down indictments of several Russians accused of masterminding the election interference. Trump used the indictments to again claim there was no evidence of collusion, though that wasn't within the scope of Friday's actions. 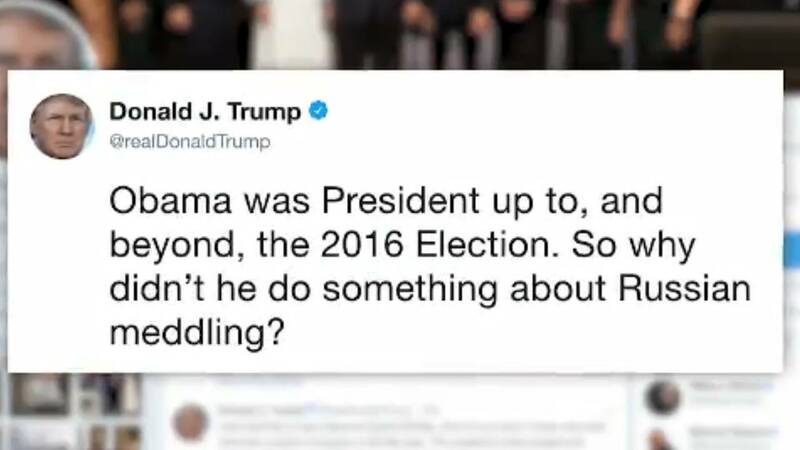 Trump is not alone in accusing Obama of failing to act when it was known Russia was attempting to sway the outcome of the US election. On Sunday, the top Democrat on the House Intelligence Committee, Rep. Adam, Schiff, told CNN's Dana Bash on "State of the Union" that the Obama administration "should have done more" when it learned of Russian meddling. Obama officials have insisted they took steps immediately to prevent the Russian interference, including a confrontation between Obama and Russian President Vladimir Putin on the sidelines of the 2016 G20 summit in China. The Obama administration also slapped sanctions on Moscow in December 2016 for the election year efforts. After Trump was inaugurated, Obama's aides have insisted that speaking out more vocally against the Russian meddling would have appeared overly political for the incumbent president, particularly as Trump was claiming the election was "rigged" and refusing to say whether he would accept the results if he lost.